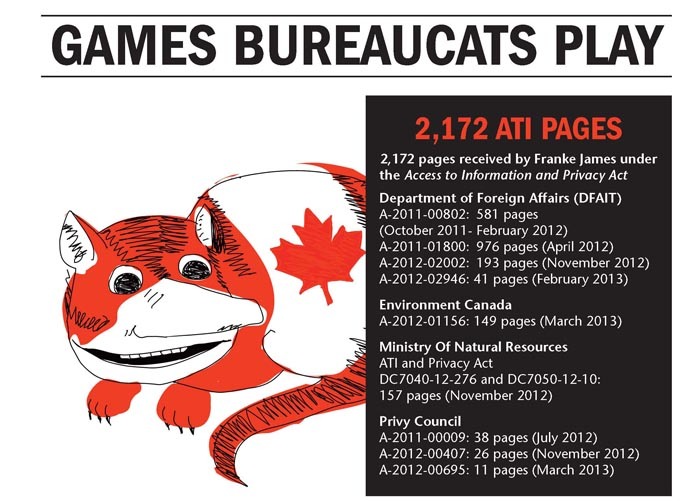 Update: See the graphic above “Games Bureaucats Play” from Franke’s new book, Banned on the Hill which confirms that she has received 2,172 ATIP documents from DFAIT, and three other government departments in response to ATIP requests from August, 2011 to March 2013. Banned on the Hill was published in May 2013. The graphic ebook will be available in August 2013 for iPad, Kindle and Google Play. 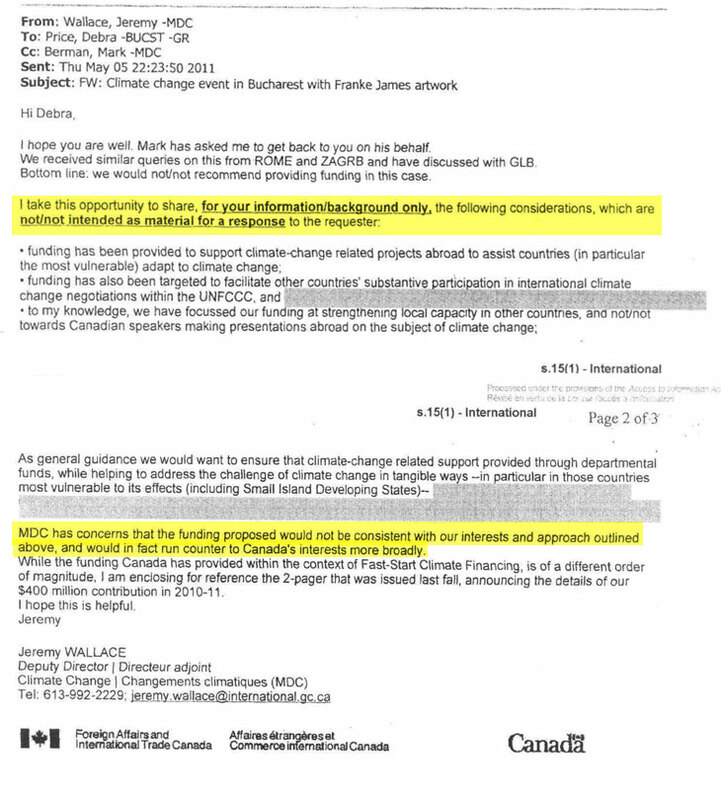 October 31/11: Internal government documents, released through an Access To Information request, show that Canada’s Climate Office in Ottawa, at the Department of Foreign Affairs and International Trade (DFAIT), made the decision to cancel Canadian support for the Franke James European Tour. These facts contradict the public statements made by the Canadian government to the media. In response to media questions, the spokespeople for Foreign Affairs, Chris Day and Jean-Francois Lacelle, repeatedly denied that approval for this project was ever given or withdrawn, and said the story “does not appear to be based on facts”. Franke responded to these government denials by submitting an Access To Information request to Canada’s Department of Foreign Affairs and International Trade (DFAIT) for all internal communications and documents related to her cancelled on European tour. On October 31, 2011, the Government issued an interim release in response to this request which includes 165 pages of correspondence by government staffers related to Franke’s cancelled tour. 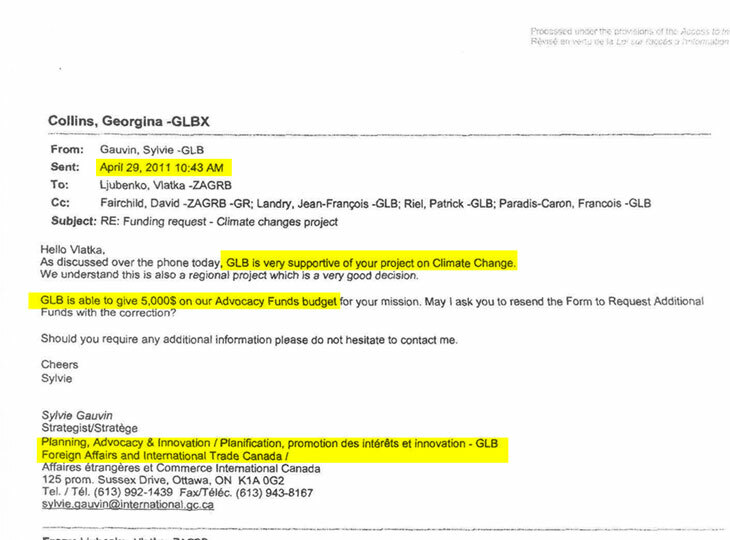 These internal government emails show that the Canadian Government did in fact approve funding and support for show, then under directions from the DFAIT’s Climate Office withdrew both the funding and support, and then tried to conceal the fact that this decision was reversed and that Canadian support was withdrawn. On May 6th, the Climate office’s recommendation for complete withdrawal of Canadian support was questioned by the counselor at Canada’s Romanian embassy, Debra Price. She wrote to Mark Berman and Jeremy Wallace pointing out the organizers of the event were not asking for funding, only wanted for “Moral Support”. She also noted that Franke’s work on climate change education and outreach appears to be “reasonably balanced”, asked if this additional information would affect their advice. 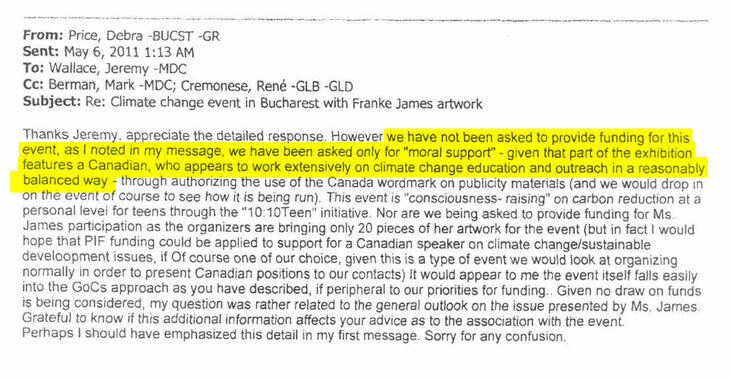 Jeremy responded to Debra by thanking her for the additional info, but confirmed that Climate Change Office’s stand against any type of support or endorsement for Franke’s art project. 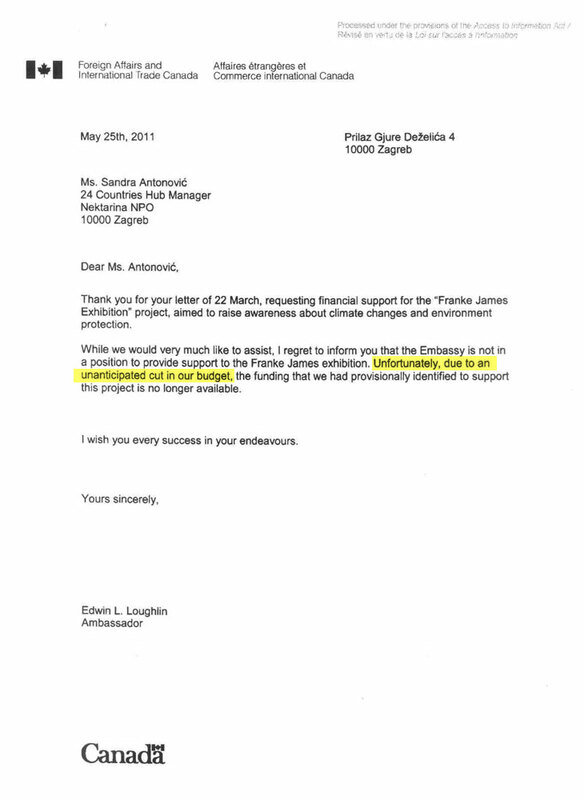 On May 25, 2011, the Canadian Ambassador in Croatia wrote a letter to the organizer of the show Nektarina Non Profit stating the funding for her project which was “provisionally identified” was now not available “due to an unanticipated cut in our budget”. This statement directly contradicts the facts in the ATI documents, which show that approval was withdrawn because, as Jeremy Wallace, the Deputy Director of Climate Change wrote, the project was not “consistent with our interests and approach”. When asked by the media about the government approval/reversal for the show, Government spokesperson Chris Day and Jean-Francois Lacelle repeated their misleading mantra, “funding was never guaranteed nor withdrawn”, refusing to acknowledge what the Government knew, as is shown in the ATI docs — that approval for the show was given but then revoked by the Climate Change office. And even though the government knew that that Franke’s stories about approval/reversal were in fact true, they publicly dismissed her questions as “not based on fact”, and as a “fantasy of her own making”. 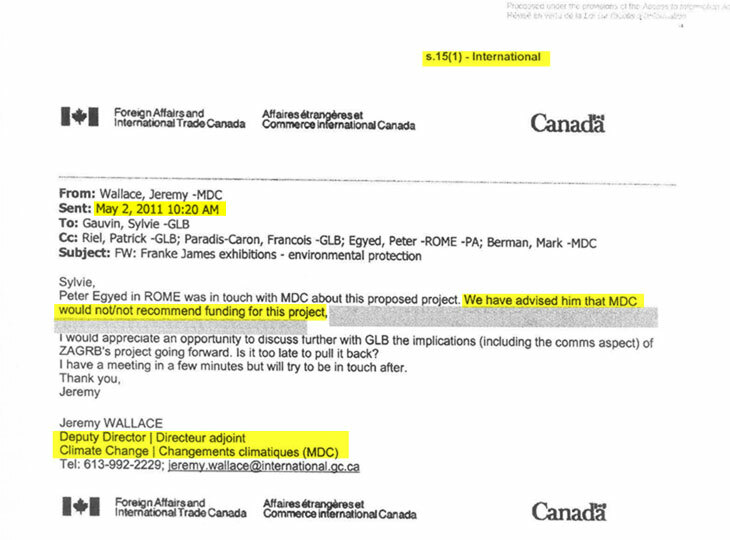 The documents, internal government emails, released through the Access to Information Act, clearly indicate that the public statements made by Canadian government to the media about its role in the Franke James European Exhibitions in July 2011 were false and misleading. The real question is, why would the Goverment of Canada to mislead the Canadian public? What about the truth? Has Canadian government’s commitment to its policies superseded its commitment to the truth? What about government’s duty to protect its citizens? Is it right for the Canadian Government to do everything it can to protect its economic interests, even if it means harming the well-being, or destroying opportunities, for some of its citizens? And if so, who decides which citizens or groups are disposable? What about free speech? Do these actions by the government — deliberate efforts to silence dissenting opinions about its policy — put the Canadian right to Freedom of Expression and Canada’s commitment to Free Speech at risk? Update: Confirmation of 1,557 pages Franke James has received from DFAIT in response to two ATIP requests in August, 2011 and January 2012.
am sure New Brunswicker Henk Tepper has wondered about that as he sits in a lebanese jail!